The 1980 DCI World Championships were held at Birmingham, Alabama's Legion Field for the second consecutive year. For the first time in DCI history, all finalist corps had made the Finals in an earlier season, and the Blue Devils repeated as Champion at the same stadium, winning the unit's fourth title in five years. 27th Lancers finished 0.35 down from the Devils after appearing in both the opening and closing ceremonies of the Lake Placid Winter Olympics earlier that year. Close behind, Bridgemen finished 0.35 down to Blue Devils and Spirit of Atlanta 0.80 down, the closest finish among the top four corps in DCI history. 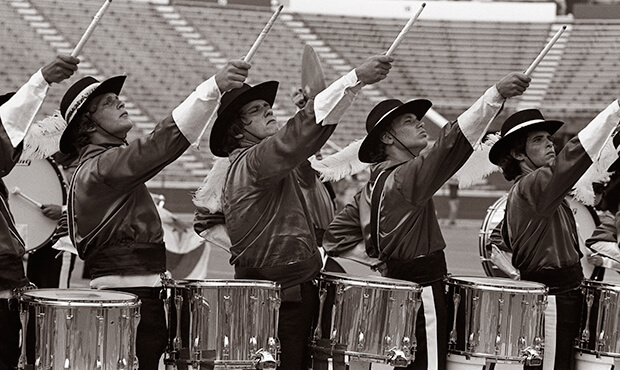 In 1980, North Star performed in the corps' third and last DCI Finals show, placing 11th. A merger of four corps from just north of Boston—Blue Angels, Cardinals, Legion Vanguard and Reveries—the corps made the 1978 DCI Finals in it's third season, then lasted two more years after the 1980 Finals appearance before disbanding. The first three selections of the corps' 1980 production were composed by Chuck Mangione, the jazz flugelhorn virtuoso who directed ensembles at the Eastman School of Music from 1968 to 1972 before venturing out on his own. The brief opening fanfare of "Hot Consuelo"—"Consuelo is loosely translated as "hope" or "solace"—originated from Mangione's soundtrack to the 1978 film, "Children of Sanchez," which starred Anthony Quinn. The year before, North Star performed the title song as its opener, while the 10th-place Blue Stars and 11th-place Cavaliers also performed the same work. The actual opener of the show was Mangione's "El Gato Triste," Spanish for "sad cat," from his 1973 album, "Land of Make Believe." It was a mid-season replacement for Gino Vanelli's instrumental composition, "Prelude to the War" from "War Suite," which came from the artist's 1976 album, "The Gist of the Gemini." The work is said to have not been received well by the judges or the fans, perhaps due to its subtleties. North Star played this piece as late as July 12 at the DCI Midwest Championship in Whitewater, Wisconsin. The opener was replaced and learned during the 13 days prior to the corps' next show. Though rare, replacing a musical selection mid-season wasn't unheard of back then. The defending Champion Madison Scouts dumped its entire 1976 funk show after an early season trip to California, took an entire month off to bring back its title show from 1975 (with a new opener) and still went on to place second at the DCI World Championships. 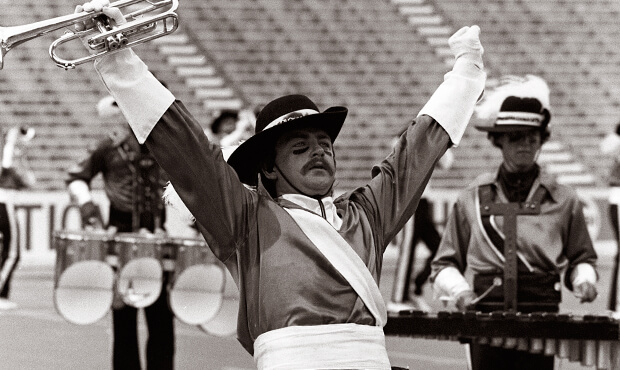 During 1977, the Cavaliers dumped half its original show, became the 18th corps to break 80 points, yet placed in the top two-thirds of finalists. Times were different then. "Where Am I Going?" was from Gino Vannelli's 1975 album, "Storm at Sunup." Vannelli was given his big break in the early 1970s when Herb Alpert signed him up to his first record contract, resulting in him touring as the opening act for Stevie Wonder. Vanelli was known for overdubbing several parts to create a unique and rich musical texture, well before the introduction of polyphonic synthesizers that could do the same in live performance. The screaming soprano solos were a perfect vehicle for North Star virtuoso Jerry Noonan, who earlier after opening the show with his stratospheric wailing, would also treat the appreciative audience to his high-note screaming in the closer. "Cookout" was an original drum solo by instructor/arranger David Vose, featuring the corps' "Big Chrome Wall" of 11 snare drums, quite an unusually large line for the time. The emotional "Still" came from Lionel Richie's 1979 album, "Midnight Magic." Ritchie became famous after joining the Motown group Commodores in 1968 before he went solo in 1982. The closer of "Ol?©" was composed by jazz trombonist Locksley Wellington "Slide" Hampton, a famed jazz trombonist. It was a staple in the repertoire of Maynard Ferguson, who—like Vanelli—was a native of Montreal. (Ferguson was co-host of the live 1979 DCI Finals broadcast on PBS.) Ferguson wanted to perform with Stan Kenton's Progressive Jazz Band in 1948, but had to wait after Kenton disbanded the group and then formed the avant-garde 43-piece Innovations in Modern Music Orchestra. Although this new orchestra—featuring a 16-piece string section—was a commercial flop, Kenton succeeded in making Ferguson a star. All movement stopped as Noonan took a solo with no accompaniment. Ferguson, had he co-hosted the Finals broadcast in 1980 instead of 1979, would surely have approved. For this week only, you can save on the Legacy Collection DVD that contains this complete North Star performance, along with all finalists from the 1980 DCI World Championship. Discount DVD offer ends Monday, July 21.